CryptoSlots Casino Welcome Bonus Offer! Discussion in 'New Player Bonuses for Casinos' started by Marina, Jul 16, 2018. We always like to hear about new bonuses launched by our favorite online casinos, and so we were thrilled to learn that CryptoSlots Casino has a great offer for new players. To welcome newly registered players, the site is giving away a 111% welcome bonus to help you get started on your gaming journey. “Your brand new CryptoSlots account is ready for action,” says the online casino. You are invited to help yourself to the deposit bonus by using the bonus code WELCOME1. It’s important to remember that before making your deposit, you should redeem the bonus code. When you do so, your account will be instantly credited with up to $500 extra. Please note the terms and conditions of the welcome bonus at CryptoSlots Casino. Maximum bonus for new players at the site is $500. The bonus comes with wagering requirements of 35X. The maximum cash out allowed from your account is $5,000. The offer applies to your first deposit. 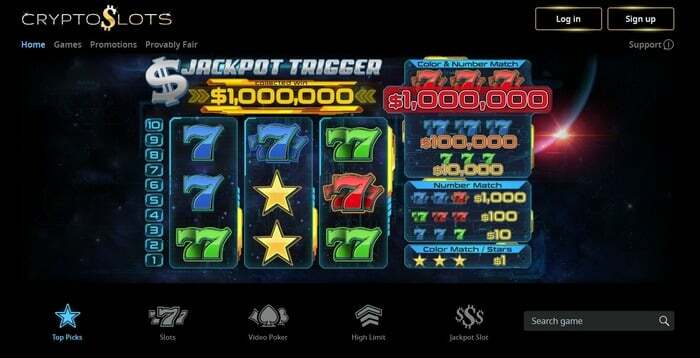 The bonus applies to all games at CryptoSlots Casino except for Jackpot Trigger. But the fun doesn’t quite stop there at CryptoSlots Casino. The site has already thought beyond your first encounter with bonuses at this site and has thus rolled out a second bonus. “Now that you have settled in here at CryptoSlots, we have another sweet treat for you,” advises the online casino. You can enjoy your second match bonus at the site in the form of a 77% bonus on your second deposit. Simply use the bonus code WELCOME2 and you will be earning even more casino cash to spend on your gaming journey. On your third deposit, there is another perk waiting for you – a 99% bonus! Use the bonus code WELCOME3 to have your account instantly credited with up to $500. The same terms and conditions of the first deposit bonus apply also to the second deposit and third deposit bonus. Finally, you will realize that loyalty pays off big time at CryptoSlots Casino. You will find a weekly cashback bonus in your inbox every Wednesday – an amount equaling 3% of the previous week’s net loss (ie. Monday to Sunday). The wagering requirements are extremely low – just 1 x. Visit CryptoSlots Casino today and start enjoying the many great offers that this site has to offer new and returning players.